Our CryptoManager Infrastructure automates and secures the provisioning of device services across the supply chain, reducing operating costs and accelerating time-to-market. It is designed to easily integrate into any manufacturing facility without disruption to existing operations. 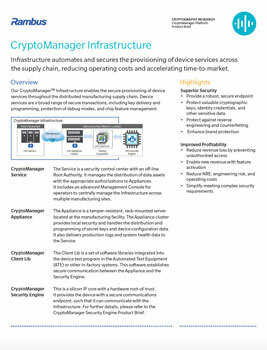 Learn more about our CryptoManager Infrastructure, and how it enables the secure provisioning of device services throughout the distributed manufacturing supply chain.